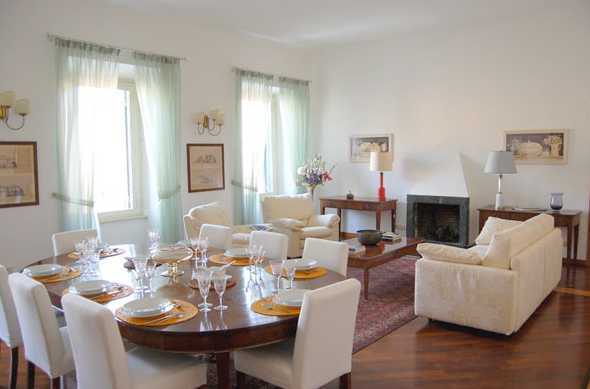 This luxury apartment is situated on the famous Piazza Navona – one of the top ten sights to see while in Rome. The Piazza Navona is the most beautiful piazza in Rome and while one of the liveliest, the apartment is fairly quiet thanks to its triple paned glass windows that look down on to the square. There are many nice outdoor cafes and restaurants in the neighborhood and the Pantheon is just a five minute walk. For many, the Piazza Navona is considered the center of Rome and one of the top 10 sights to see while visiting the eternal city. It 's certainly the most famous and, arguably, the most beautiful of Rome's many squares and an ideal place to call home while visiting Rome. Besides its central location for sightseeing, shopping and dining, with convenient bus stops to take you to all areas of Rome, this large and lively square features no less than three magnificent fountains and the incredible baroque church of Sant'Agnese in Agone, all giving you a beautiful neighborhood soaked in history and art. The square is built on the former Domitian's stadium, built by emperor Domitian in 86 AD, hence the long, oval shape of the square. The stadium, which had a larger arena than the Colosseum was mainly used for festivals sporting events. In Roman times, it was called 'Circus Agonalis' (competition arena). It is believed that over time the name changed from 'in agone' to 'navone' and eventually to 'navona'. In the 15th century the stadium was paved over to create the Navona square, but remnants of Domitian's stadium are still visible around the area. Guided tours to this underground monument are recommended. The main attraction of the Piazza Navona are the three fountains. The central and largest fountain is the Fontana dei Quattro Fiumi (fountain of the four rivers). It was constructed between 1647 and 1651 on request of Pope Innocent X. The design of the fountain was first commissioned to Borromini, but it was ultimately handed to Bernini. The fountain features four figures, each representing a river from a different continent - the Nile, Ganges, Danube and Rio della Plata. The statues are at the base of a rock supporting an obelisk, originally located at the Massenzio Circus. The two other fountains on the piazza are the Fontana di Nettuno (Neptune fountain) at the northern end and the Fontana del Moro (Moor fountain) at the southern end. The Fontana del Nettuno, also known as the Calderari, was built in 1576 by Giacomo della Porta. The statues, Neptune surrounded by sea nymphs, were added in the 19th century. Giacomo della Porta also built the Fontana del Moro. The central statue of a Moor holding a dolphin, a design by Bernini, was added in the 17th century. The tritons are 19th century additions. Another highlight on the Navona square is the church of Sant'Agnese in Agone. It was commissioned in 1652 by Pope Innocent X to Saint Anges, who was a member of the Roman nobility, born c291 and raised in a Christian family. According to legend, she suffered martyrdom at the age of twelve or thirteen during the reign of the Roman Emperor Diocletian, on January 21, 304 on the very spot the church now stands. The front façade of the baroque church was designed by Borromini, Bernini's main rival. Construction started just two years after the completion of Bernini's Fontana dei Quattro Fiumi, right in front of the building. The church was finished in 1670. Last but not least is the famous ristorante/café Tre Scalini's – it was here that the famous ice cream dessert known around the world as the tartufo was created. Sit at an outdoor table on the square and people watch at least one evening. The backdrop is mesmerizing: lighted fountains, artists, mimes and souvenir hawkers mixed with an international crowd of sightseers - a very pleasant way to spend the evening. Then retreat to the quiet of your apartment just across the square! Take the elevator up to the second (US third) floor and enter the apartment through a long foyer with an antique coat rack and pretty antique bench. To your right is a glass door that opens to the side of the small balcony facing an inner courtyard. Further down the foyer on the right is a fully equipped and large square shaped eat in kitchen with access to the same balcony. When you reach the end of the foyer's hallway, you enter into the dining/living room. This room is very spacious, almost 600 square feet of living area, with three windows that look out onto the famous and magical Piazza Navona. As you can imagine, there is a lot of light in this apartment, but the large windows are triple paned and are surprisingly quiet for being in the center of a main tourist location. The dining area is dramatic, with an impressive wood table surrounded by 8 white upholstered chairs. The dining space flows seamlessly into the living room area with inviting plump upholstered sofas and chairs in the same white fabric and the dining chairs are centered around a stone trimmed fireplace. Soft, billowing sheer curtains in a pastel green and handsome wall sconces add an airy and elegant feel to the room. A full bathroom is located off of the living room that serves the two bedrooms off the hallway. The bedrooms are reached from the rear of the living room. On the left of the hallway is a queen bedroom followed by a twin bedroom. Both bedrooms face the Piazza Navona and share the bathroom at the entrance to the hallway. On the other side of the hallway is the entrance to the master bedroom. Here you enter a spacious study with a handsome antique desk and a double sofa bed. Walk through the study into the walk-in closet/dressing room and beyond is the king size bedroom with a glass door leading out to the same balcony facing the inner courtyard. This bedroom has a en suite bathroom with tub and wall mounted shower. Prices listed are for 6 guests. The sofa bed in the study will accommodate an additional 2 guests for $45 per night / additional guest.